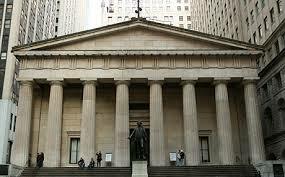 Federal Hall was re-built in 1842 to memorialize the important site where George Washington was inaugurated and where our nation’s first capitol building. This is where George Washington’s inauguration occurred. Now, you can see a huge statue of George Washington out in front, which makes for a funny photo with it looking like he is patting your head. In the building, there are interesting free exhibits, information centers, and a gift shop focus on colonial and early America.